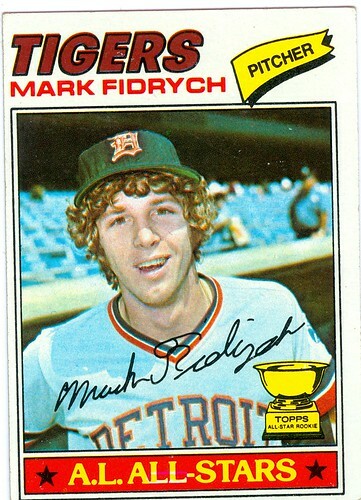 I'm sure most of you know that Mark Fidrych died yesterday. There is a big section devoted to him in today's Detroit News. I was 8 years old in the summer of 1976 when the Bird had his magical season. I don't remember much about it. I do remember my step brother, who was a couple years older than me, telling me about the Bird and how awesome he was. To me he was a face on a million magazine covers, not a ballplayer. A few years later, probably 1979 or 1980, my Dad took me to Tiger Stadium to see a game. We were seated down the left field line out by the Tigers' bullpen. At some point during the game a commotion started by the Tigers' dugout and people started standing and pointing and announcing that they saw the Bird. I looked toward the Tiger dugout and I saw him. He was walking from the dugout to the bullpen. His famous hair was poking out from under his hat and the crowd was getting louder as he walked down the foul line. Finally we were so loud, everyone standing and cheering that, that he acknowledged us. He was bobbing his head, waving his cap, raising his hands above his head and he had a huge smile on his face. At that point we were screaming like he was on the mound and fixin' to finish a complete game shut out. Then he disappeared into the bullpen. That was it, we didn't see him for the rest of the game. A good two years after his magical season and just a short walk from the dugout to the bullpen by the Bird and he could electrify a crowd. 1976 - what a great year. Mark The Bird, you will be missed.